DAF 575 engine with120 Hp, total of 4981 hours. Well looked after by an ex navy engineer. 11.54 m dutch steel cruiser offers a large aft deck and a flybridge all integrally covered. Access to saloon by a ladder, sofa could be used as a single bed (80 x 180 cm). Aft owner's cabin with double bed (160 x 190 cm) lots of storage, desk. Port side, another smaller cabin with single berth (80 x 180 cm). A second bunk bed could be installed. On star board, heads and shower room. Forward, an open double V berth and open galley (all gas) and dinette could be transformed in a double for occasional guests. Cabin headroom 1.90 m.
Electric radiators on board, blown hot air to be checked as not used anymore. Dutch steel cruiser for sale in France. 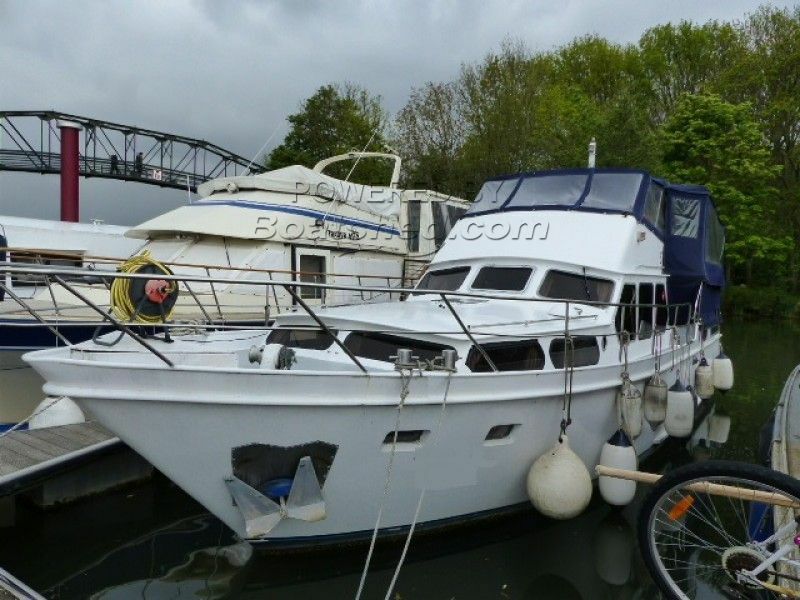 Boatshed Paris is happy to offer this 11.54m VALKKRUISER from 1980 for sale. Huge cruiser, eighties style but offering a great accommodation potential, 8 persons can easily sleep on board! Aft deck and a raised fly bridge will help everybody to find a quiet place on board. Ideal ri ver cruiser could do coastal if all equipped accordingly. 20 min form Paris by public transport. For more information or organise a visit, please contact, Pascal,, your local broker at Boatshed Paris. This Steel Dutch Motor Cruiser Fly Bridge has been personally photographed and viewed by Pascal Gaetan of Boatshed Paris. Click here for contact details.